Almanac creates evening-length performances, site-specific work, and immersive experiences, and provides educational workshops/programming, and community/youth outreach. In all of our services, we strive for originality and the highest possible quality. We connect people across borders and stack bodies on top of ideas.We attack seriousness with sincere ridiculousness and closed doors with open gates. 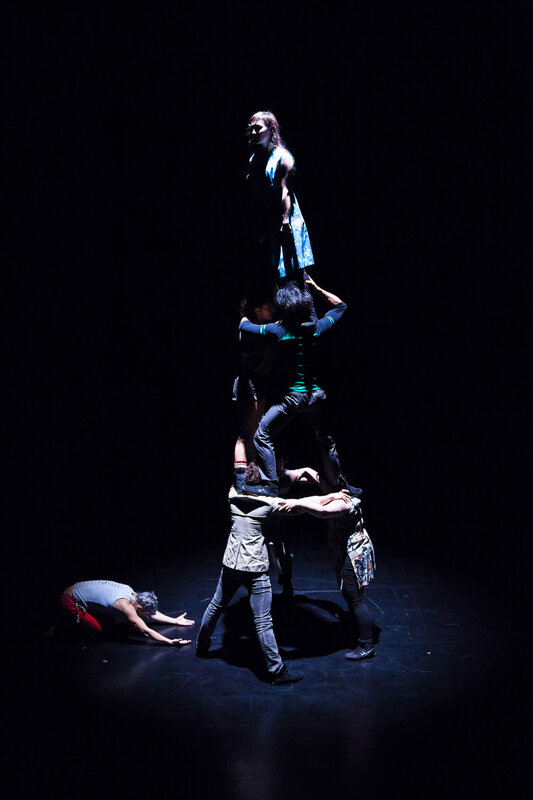 We believe that the artful sharing of stories and the creation of original work through our unique method of ensemble creation is a service to humanity. We’re rigorous in our approach to learning new technical skills across genres and we are committed to deep investigations of our chosen themes or ideas. Almanac expects our company members to bring positivity, participation, and openness to every act of creation. We make a home for everyone’s ideas and a place for imagination. As a company we encourage balance, self-care, and flexibility in our practices. We acknowledge that hard work and wellness are continuous and forever linked. Almanac is theater that displays the human cost. We make things that are surprising, hiding in the uncanny valley between the human and the superhuman. We work hard, fly high, and take risks. Generosity is giving all you have to a project and providing opportunity to others. Rigor is hard work. We push our physical boundaries and are hungry to learn. Freedom is lightness. When we achieve a high level of mastery over our movement, our structure, or our craft, we are free to play, explore intricacies within our disciplines, and become conduits for emotive content. Through sweat and togetherness, we create a ship on which we can live, celebrate, and most importantly, travel. We can drift, traverse, and weather all elements. This journey is our destination, which is dependent on our strong vessel. What is under the surface?What stories can we unearth? We celebrate and strive for the recognition of the underdogs, the underheard, and the improbable. We take pride in our accomplishments and in caring for each other. In following these values we are ready, excited, and curious. We parade forward with our creations, ideas, and love.